You have confirmed your pregnancy with your doctor, spoken to your partner, and begun making plans for the future. A million things are running through your mind. On top of all of this, you are most likely going to work, school, or already being a parent to your other children. It is now time to sit down and write your first trimester to do list, and take some of the anxiety out of an already stressful time. Below is a list of some of the most important things to take care of during your first trimester. Print this list out, or make your own, and check off the items as you go! You’ll feel accomplished, less overwhelmed, and one step closer to the birth of your new baby. Find an OB/GYN- If you already have one, or see a gynecologist who practices obstetrics as well, that’s great! If not, ask one of your healthcare providers, family members, or friends who have recently had a baby for a referral. Important factors when looking for an obstetrician include finding one that your insurance covers, somebody you feel comfortable with who doesn’t rush you, and that can answer questions in a way that you understand. It is important to remember that what works for one person may not always work for you. 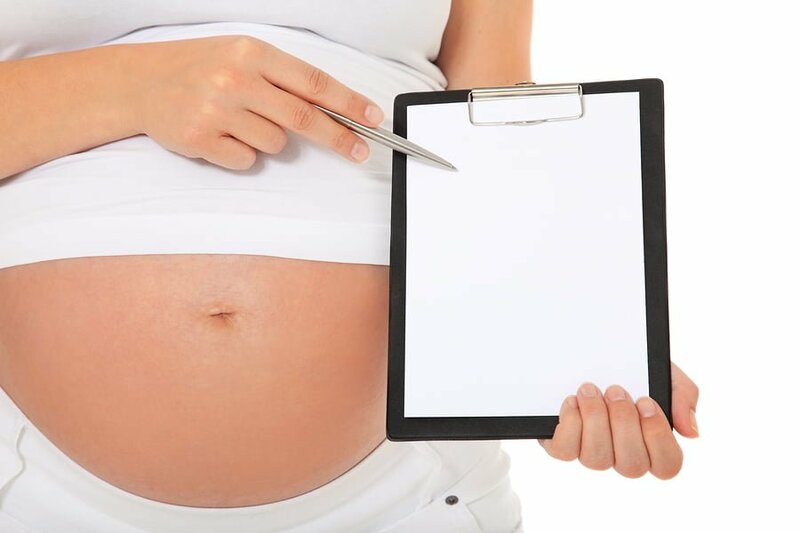 While choosing a doctor it is also helpful to look into choosing a hospital where you plan to deliver, in order to avoid this hassle later in the pregnancy. Schedule your first prenatal checkup- The first prenatal checkup should occur 4-8 weeks from your last period. Begin taking a 400 microgram folic acid supplement and 10 microgram vitamin D supplement daily. Avoid all medications unless specifically approved by your doctor. Begin avoiding unsafe foods including some cheeses and unpasteurized dairy products, raw or undercooked eggs, liver and pate, and raw shellfish. Quit smoking! We are all well aware of the dangers of smoking to our own health. Smoking also increases the risk of miscarriage, ectopic pregnancy, and a low birthweight baby. Cut out alcohol! According to the National Institute of Health, pregnant women are strongly urged not to drink alcohol during pregnancy. Drinking alcohol while pregnant has been shown to cause harm to babies as they develop in the womb and may lead to long-term medical problems and birth defects for the child. Reduce caffeine intake. About 300 milligrams of caffeine per day, the amount in about two cups of coffee, has been found acceptable. But some studies say 200 mg per day can increase the risk of miscarriage. To be safe, limit yourself to just one morning cup of joe. Learn the red flags. Excessive bleeding, excessive nausea and vomiting, and fever are only a few signs that you should never ignore. Keep a list that you can refer to so you know if and when it is necessary to call your doctor. Decide when to announce your pregnancy. Begin gentle exercise. It helps to reduce stress, and the other aches and pains that come with pregnancy. Exercise may even help to fight off that chronic fatigue you’ve been experiencing. Begin pelvic floor exercises. Weak pelvic floor muscles contribute to urinary incontinence after pregnancy, which affects 70% of women. Contract these muscles 20 times at 10 second intervals, 5 times a day. Buy a maternity or sports bra. Chances are you will outgrow your regular bra by weeks 8-10 of pregnancy. Find a bra that provides comfort and support for your growing, achy breasts. Begin budgeting for your baby. Think of the costs that your pregnancy and a new baby might pose. Be sure to factor in possible docked pay during maternity leave. Start budgeting and saving up to avoid stress later! Prenatal testing. Options that will likely be offered to you by your doctor include Chorionic Villus Sampling (CVS) and Nuchal Translucency Screening. CVS is an optional test that is often done between weeks 10 and 12 of pregnancy. Mothers over the age of 35, or those who have a family history of genetic disease, often choose to undergo this testing where sample of the placenta is taken for biopsy in order to rule out any chromosomal disorders. Nuchal Translucency Screening is a noninvasive ultrasound performed between weeks 11 and 14. It screens for Down syndrome and other chromosomal disorders, as well as congenital heart defects. Though this test does not determine a definitive diagnosis, it could provide reason for further testing.